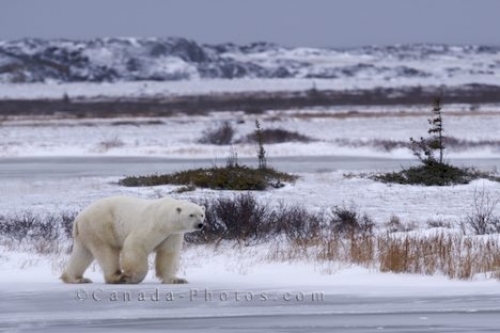 As a Polar Bear roams across the frozen tundra in the Churchill Wildlife Management Area in Manitoba, Canada, his front feet seem to lag across the ice with each step. In reality, his huge paws with black pads on the base and fur between each toe, make it easy for the polar bear to walk across the slippery surfaces. The frozen tundra and the appearance of winter is what the Polar Bears have been waiting months for and it is now time to make their way to the shores of the Hudson Bay. Here they can venture out on to the frozen sections of water and hunt down some meals of ringed seals which will fatten them up throughout the cold months and prepare them for spring. As the ice thickens and winter closes in around the Churchill Wildlife Management Area, walking long distances is not required as they spend a majority of their time near the water. A fair amount of bare tundra is still visible in this picture, but that can rapidly change overnight and create frozen areas with temperatures remaining well below zero. Picture of a Polar Bear walking across the partially frozen tundra in the Churchill Wildlife Management Area in Manitoba.